Which airline has worst food? Rude staff? Airline passengers are most frustrated by fees for things that used to be free, a survey found. 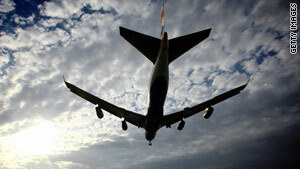 (CNN) -- Passenger satisfaction with domestic airlines continues to improve, according to one survey released Tuesday. But air travelers are nostalgic for the days of free creature comforts, finds another. Fliers also had a chance to vent about airlines with the worst food and the least-friendly flight attendants. Overall, air travelers' level of contentment with carriers is on the rise, according to the University of Michigan's latest American Customer Satisfaction Index for the airline industry. The findings are similar to the J.D. Power and Associates 2010 North America Airline Satisfaction Study released last week. Fewer people flying and passengers becoming savvier about avoiding fees boosted contentment, but probably only for the short-term. "Airlines are creating more satisfied passengers, but the... data suggest this won't last for long," said Claes Fornell, founder of the satisfaction index, in a statement. "Airlines are already beginning to charge higher fares. Flights are becoming more crowded, and the increasing number of carry-ons could lead to cabin congestion and delays." When it comes to individual airline satisfaction rankings, Southwest Airlines leads the pack for the 17th straight year, followed by Continental and American, according to the index, which uses customer interviews to come up with a score on scale of 0 to 100. United Airlines was at the bottom of the list. Southwest also got the thumbs up in a poll of air travelers conducted by Airfarewatchdog.com. More than 2,100 people took the informal online survey on the company's website between May 17 and June 3. Southwest's flight attendants were also voted as the friendliest in the industry, followed by Delta/Northwest, JetBlue and American. But the staff at Delta/Northwest seems to have as many foes as fans, because the airline was also ranked as the carrier with the least-friendly flight attendants in the survey. United and American were ranked second and third in that category. Not surprisingly, the survey also showed that air travelers are frustrated with paying extra for amenities that used to be free, like checked bags. Fees were the No. 1 complaint when passengers were asked what they disliked most about flying. What are air travelers willing to pay for? Alcoholic drinks, access to the Internet and extra legroom, according to the survey. Less than 1 percent said they'd pay for a pillow or blanket. And what would air travelers say to the CEO of their favorite airline if they had a chance? Here's one response: "Feed us food you'd eat yourself." As for which airline has served the worst food over the past 12 months, Delta/Northwest led the pack, followed by United and American.